A mixed week in global equities, which saw UK investors reduce exposure in the FTSE and European investors increase exposure in the German DAX Index. We see further downside risks in the UK market, but see potential for further gains in the latter, before prices also settle into consolidation. The broader based EuroStoxx 50 Index, however, remains trapped in range, and this lack of bullish sentiment could also weigh on the German index in the coming weeks. In the US, the increasingly volatile political situation is currently not reflected in the S&P500 Index. 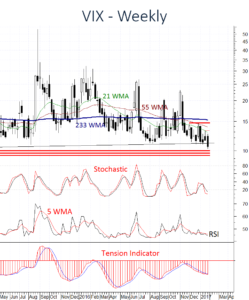 In fact, the SPX is making fresh contract highs against a falling VIX. 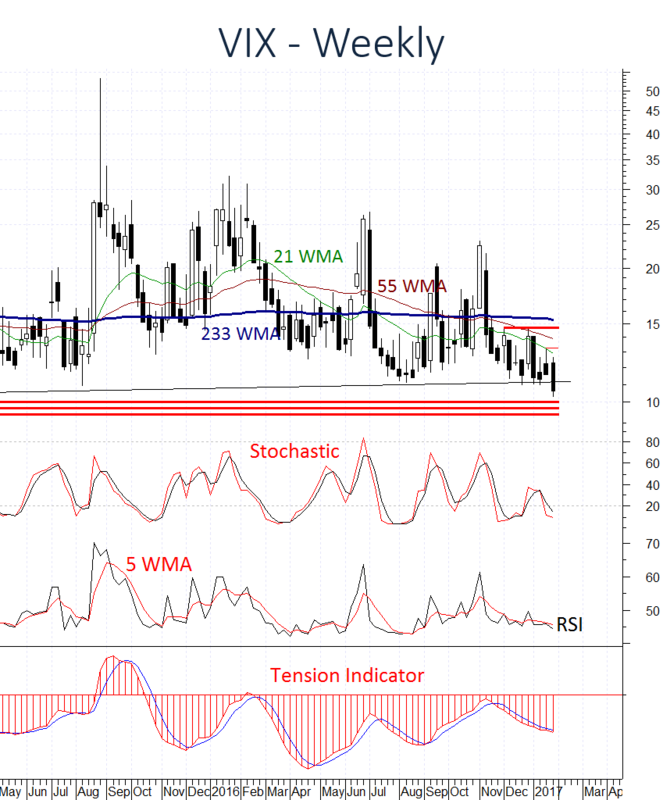 It is interesting to note, however, that the VIX is approaching critical supports, and a bounce from current levels could promote a sharp reaction in the US markets. We remain cautious of further gains in the S&P500 Index. China and Hong Kong has also managed to recover, but the Lunar New Year holiday will keep prices and liquidty muted into the coming week. Finally, Emerging Markets are extending gains, but we remain vigilant of a correction in the coming weeks. In the coming weeks, we remain cautious of further equity gains, and anticipate a corrective pullback as money managers reduce their global equity allocations. However, we are constructive in the longer term, as underlying strength suggests investors are currently maintaining a buy-into-weakness strategy. The USD DXY Index remains under pressure, although a short-term corrective bounce is possible in the coming sessions as daily studies unwind oversold areas. There is no change in the bearish weekly readings, however, and we anticipate further downside risks in the coming weeks. As mentioned previously, the obvious beneficiary will be the EUR, with EUR/USD extending the anticipated corrective bounce. USD/CHF and USD/JPY are following the USD lower. The commodity currencies, AUD and CAD, are mixed – AUD/USD is coming under marginal selling pressure, whilst USD/CAD is turning lower. GBP/USD is the current star performer, with prices maintaining the sharp bounce from the 1.2000~ lows of mid January. We see scope for further gains in the coming weeks, and are now monitoring the longer term monthly charts, as there are early signs of a trend change developing. Collectively, this suggests investors will maintain a bearish USD stance, whilst sentiment in GPB/USD continues to improve. Another mixed story in the commodities space, Gold is now coming under pressure, following the recent bounce, whilst Oil prices remain balanced in range. There is risk of a short-term pullback in the Energy space, however, but the dominant bull trend is intact, and we expected investors will use weakness as an opportunity to increase exposure. Copper prices are pressuring range highs, and whilst a short-term pullback is possible, we see further price gains in the coming weeks. There is a similar story developing in Corn, as prices turn back from Fibonacci resistance. However, investors are expected to continue increasing exposure in Base Metals and Agriculture. All in all, we see increased downside risks in global equities and risk of deeper USD reactions. There are early signs of improvement in GBP, however. The commodities space is expected to continue benefiting from cross asset rotation, as money managers move their extra USD into Copper and Corn. Both Gold and Oil will likely benefit following a corrective pullback.